Although the AXIS fought the good fight, the Allies 2:1 advantage in units allowed them to squeeze out a victory (they only won by 10%). Sunday afternoon and I'm taking the SMS Hindenburg down to the water for it's first speed trial. Photo used with permission of Joe Kutz. Masted but not rigged, the Hindenburg poses during speed trials. Steve Pavlovsky tweaks the props on the IJN Nagato at speed trials. Immeasurable assistance was provided by technical representative from the planet AAXXIISS. Here a TechRep replaces the superstructure after performing maintenance "under the hood." Our TechRep appears pleased by the appearance of the Hindenburg. What do the signal flags say? "Wail Away 98" of course. Soon after the earlier photos were taken, and shortly after drinking from a Coke offered to him by a "friendly" Allied captain, our TechRep was struck down by a mysterious illness and died. He was buried with full military honors. Bob Amend helps rookie Dave Lawrence (standing) prepare the IJN Mutsu for battle Monday morning. Monday morning and the SMS Hindenburg is ready to battle. At this point I was really pleased by the appearance of the white over black paint scheme - it was a great change from the coat of grey worn by everyone else. Of course, until I repainted on Wednesday, all I heard from the Allied side was the all too frequent cry, "Get the White Boat!". Battle is joined. At this stage of the battle it is three AXIS vessels against 11 Allied ships. Frank Pittelli's Bacon Maker #1 (second ship from the front) comes in on a ram check. The ram caused his superstructure/center deck area to come off - it is floating to the left of the grey USS California at center/rear. A North Carolina rams a HMS Invincible out of its way as the Allies converge on Fluegel's SMS Baden (barely visible between the rearmost NC and I-boat). 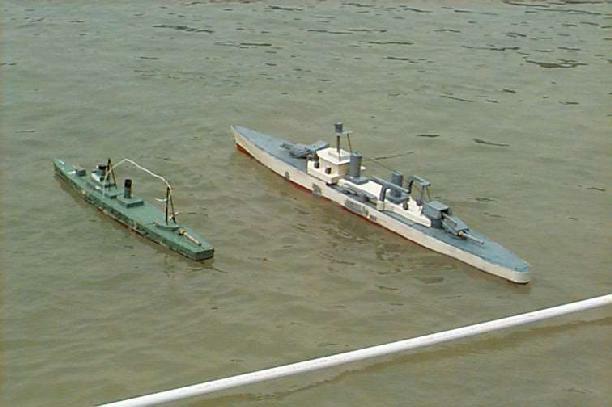 Fluegel's SMS Baden is framed by a NC on the left and a South Dakota on the right. 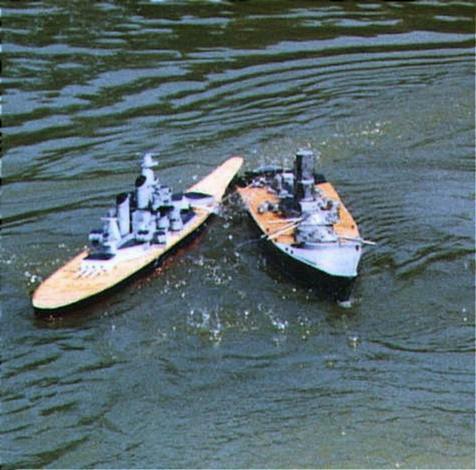 The USS Wisconsin (left) and the IJN Musashi fight it out in a battle of the behemoths. IR/CWCC Founding Father Stan Watkins recovers his USS Washington from the far side of the lake. Steve Pavlovsky's IJN Nagato surrounds a weakened 6 ship Allied squadron. Orril Ferguson's IJN Okinoshima (the Gnat) and Mike Deskin's FNS Monte Calm (?) take out targets during convoy. The SMS Bayern outmanuevers another six ship Allied squadron. 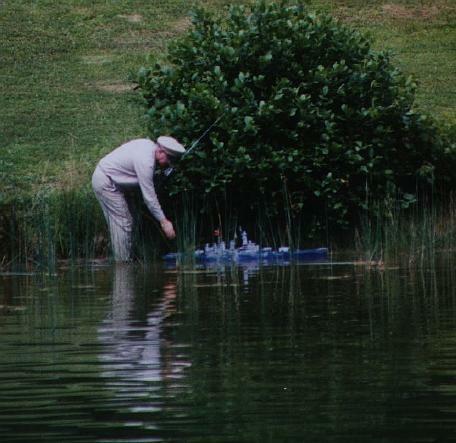 Lief Goodson pulls his SMS Bayern out of the water. Marty Hayes Austrian battleship Szent Istvan pumps a weak stream of water while Steve Andrew's SMS Von der Tann looks on. 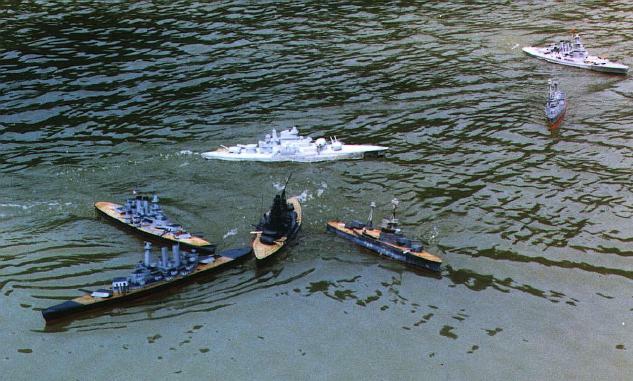 The Szent Istvan goes under as two I-boats come to help the Von der Tann look for survivors. Several survivors were recovered from this piece of floating superstructure. This page � Copyright 1998, Thomas L. Tanner, Jr. unless otherwise noted.